DABBLER is a traditional double ender noted for seakeeping ability. Her traditional appearance is complimented with a sail plan that is easy to handle and effective on all points of sail. She has accommodations for two in a cozy cabin. Two quarter berths are possible. The cockpit is roomy for daysailing with family and friends. She has a shallow draft to extend cruising range. Construction is glue lap plywood and plywood molded Vee bottom. An option is included for plywood sides with a 3/4" sheerstake to set off her pretty lines. 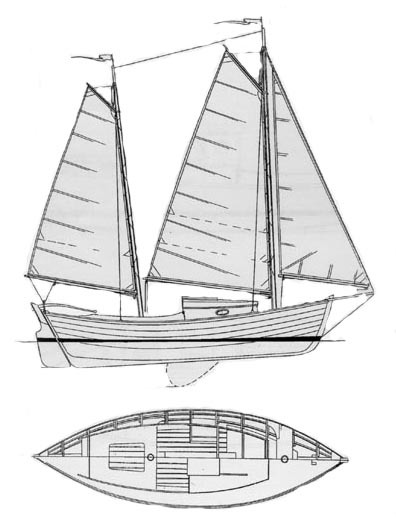 Plans include: materials, lines, construction, and sail plan. Estimated cost for quality construction materials (not including power or sails) is $28000. This cost includes a high level of outfit and finish you can be proud of after putting the effort into building this fine boat. Purchase and Download Study Plans for the DABBLER for $5.00 in PDF format (zipped file). Purchase Construction Plans for the DABBLER for $260.00 for delivery by US Postal Service. Purchase Full Size Frame Lofting for the DABBLER for $260.00 for delivery by US Postal Service.